The simple to remove racks make this body quite versatile. Offering the producer or hauler a flat platform deck during the off season. Perfect for moving hay, equipment and sundry cargos. 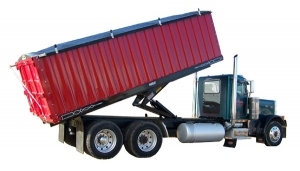 Parkhurst Stakeless Grain Bodies offer durability, strength and larger payloads. Corrugated panels are one piece, clean flow design with heavy guage tubing top rail. You can choose between triple and double rear doors with one, two or three metering gates. 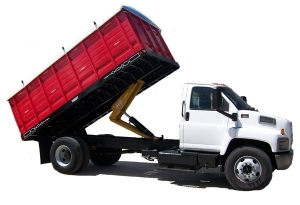 Swing out header bar allows forklift access for hauling bagged/skidded material.. 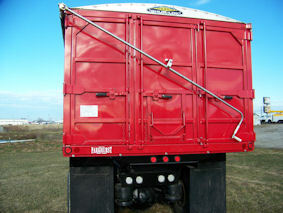 Put a Parkhurst Stakeless Grain Body and Parkhurst Hoist on your next grain truck. You will be glad you did. 10 gauge reinforcing liner at crossbar attachment area. Full length tarp rail 3” x 2” x 11-gauge tubing. Bottom plate 3” x 14” with pre-punched holes. Cross bars 1 ½” x 1 ½” x 14 gauge tubing. Doors feature fully welded unitized 12-gauge frame pre-hung, with cam lock on each door. 3” x 2” x 11-gauge tube swing out header bar. Triple door has one metering gate (7” x 15”) in each door. Door options to suit your application. 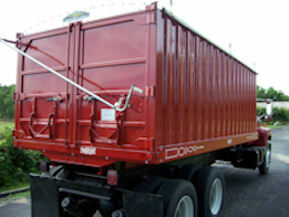 The cargo doors evolved through years of experience in the grain fields. Not cheap but worth every penny load after load, year in and year out they keep swinging.